It's time for another new regular feature from Mondesi's House: Know Your Elders. With the sports blogosphere being a relatively new phenomenon, I feel that a great percentage of sports history's off-field antics have gone virtually ignored. I want to right that wrong and let you know that no, players in the '20s, '60s, or '80s weren't necessarily altar boys. Highland Park HS in Dallas, where he was a teammate of future Hall of Famer Doak Walker. The Texas Longhorns. He was a College HOFer and 4-time All-Southwest Conference QB, scoring every point in Texas' 40-27 win in the 1946 Cotton Bowl. He married his UT sweetie, Carol Ann Krueger, and left with school records for completions, attempts, and yards. By all accounts, Layne was your prototype, corn-fed stud QB. Chicago Bears, 1948. He was chosen 3rd overall in the '48 NFL draft by the Steelers, surely higher than Mel Kiper, Sr. had projected him. He was also chosen 2nd overall in the '48 AAFC draft by the Baltimore Colts. But the Steelers dealt his rights to Chicago, where he was sweet-talked into signing with the Bears by George Halas. Layne turned down $77K worth of Colt Cash in the process. New York Bulldogs, 1949. After one year as a Bear, he was traded by Halas to New York in a salary dump. Thanks a lot for the loyalty, Papa Bear. Detroit Lions, 1950-58. Once again, Layne was traded after one year with a team. He was immensely talented, yet kept getting passed around the league. Think of him as Alfonso Soriano 60 years ahead of his time. 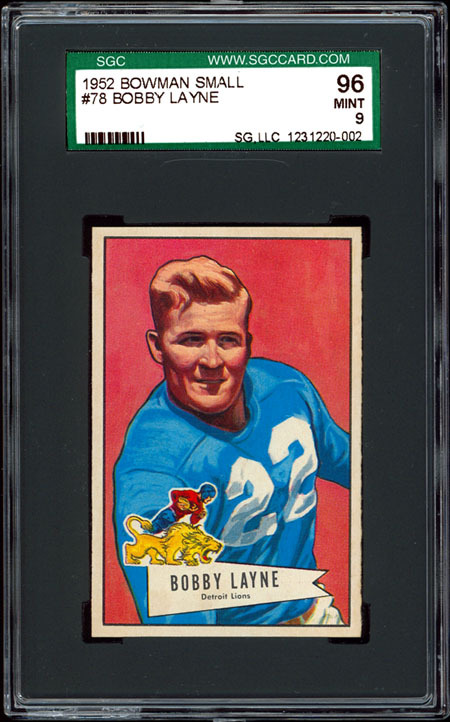 In Detroit, Layne was reunited with Doak Walker and led the Lions to three titles during his time there. He also racked up four Pro Bowl appearances and four All-Pro honors. Again, this was all during his time as a LION. Contrary to what you've heard, the Lions did have success before the Matt Millens, Scott Mitchells, and Wayne Fontes of the world came along. Pittsburgh Steelers, 1958-62. Ahh, now you see where I was going with this. 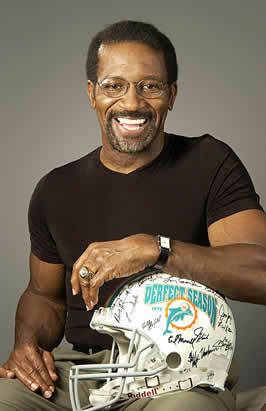 He was a Steeler! Layne was traded to the Stillers in '58 and immediately said that "the Lions would not win for 50 years". So I guess we can all bet on one more year of Lion losing before Jon Kitna hoists the Lombardi Trophy in '09. During his time in the Steel City, Layne reached two Pro Bowls, in '58 and '59, also getting All-Pro honors again during those years. His Steeler teams declined each year, with records of 7-4-1, 6-5-1, 5-6-1, and 6-8 from 1958-1961, but ended on a high note with a 9-5 mark in '62. Unfortunately, in 1962 the only way to advance to the championship game was to win your conference, and their 9-5 record was three games behind the 12-2 New York Giants. Layne then retired, saying that the biggest disappointment in his NFL career was not winning a championship for the Steelers and for Art Rooney. Unfortunately, no quarterback pulled off that feat until Terry Bradshaw in 1974. In fact, the first playoff game the Steelers ever won was the Immaculate Reception game in the 1972 playoffs, losing the next week to the 17-0, champagne-sipping Miami Dolphins, 21-17. Yes, only five more points could've shut up Mercury Morris 26 years ago. --As you can see, Layne was the cover boy for Time Magazine, 11/29/54. It'll run you about $25. --An unapologetic party animal who died shortly before his 60th birthday, probably as a result of his heavy drinking. --Famous quote: "If I'd known I was gonna live this long, I'd have taken a lot better care of myself", later used by his Dallas neighbor and fellow alcohol abuser, Mickey Mantle. --Said he wanted to die by running out of cash and air at the same time. In his first year with the Lions, a feud erupted between Layne and the late Bo McMillin. McMillin wanted to call the plays from the bench all the time and Bobby refused to work that way. Although this protest threatened his career, Bobby stood strong and said he would quit before playing another season under him. The Detroit management bought out McMillins contract and hired Buddy Parker to coach the Lions. Parker felt that if a quarterback was properly prepared during the week before the game, it should be up to him to use the proper plays. Parker would send in a play only when someone upstairs detected a weakness in a particular defense. So there you have it. Now you can wow your fellow Steeler friends with knowledge of the other hard-partying Steeler quarterback. This guy would've been a gold mine had I blogged the 1960 Steelers. Another awesome first for Mondesi's House. You are a step ahead of the rest my friend. My Dad used to tell me about watching Bobby Lane when he was a kid. I think it's safe to say that Bobby Lane = Hero to all drunkards!!! And I liked this a lot, you should do more! And he was such a hero that I misspelled his name twice! "Credited with creating the two-minute offense"
Now that is a story I'd like to hear more about. The 2 minute offense changed football, and def made it a more exciting game. I agree. You should know your elders. You respect them in that way.